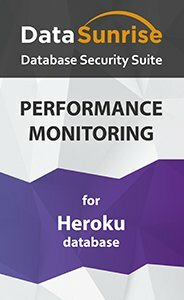 DataSunrise Database Performance Monitoring Tools present all information on Postgres database operations and functioning on Heroku visually. This is a very convenient way to assess a database performance. Collected information can be used to resolve problems and make Heroku Postgres workflow smooth and efficient. Database performance monitoring tool from DataSunrise for Heroku presents information about database operations and functions visually. That simplifies assessment of customer Postgres database on Heroku and helps to identify bottlenecks hindering normal database operation and sources of operation delays. Using graphical information provided by DataSunrise for your Postgres databases on Heroku you can look through all running scripts and see which one might be causing delays and problems. Also, you can have detailed information on queries made your databases and rectify vulnerabilities putting in danger normal operation of your Postgres databases on Heroku. Examination of query logs sent to your database. This feature reveals queries redundant or unexpected by DB administrators and developers. Visual presentation of response logs. You may find this information highly useful, for instance, when looking for source of application malfunctions. Estimation of time necessary to execute a query. Tracking of query type change with time. Determination of query types (INSERT/UPDATE/DELETE/SELECT). and execution frequency depending on the type. General information on a number of operations executed a second. Analysis of the presented information gives a broad and aggregate picture of a database status. This information facilitates assessment of DBMS processes, identifies operation delay causes, can be used for application debugging and development and well as serves a timely warning so that preventive measures might be taken to improve Postgres database operation on Heroku.